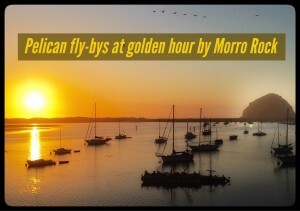 I’m here in Morro Bay this week as part of my Year by the Water. I am filled with sweet and bittersweet memories. This is the where my mom and dad lived – actually nearby Los Osos – for the last years of their life. I can picture it as if it were yesterday. Our entire extended family sat in a circle, each of us opening one present at a time. As soon as Dave unwrapped his gift, he knew what it meant. He threw the box up in the air and ran outside. Unfortunately, there was … gravity … and the manure rained down on Mom’s beautiful red wool knit Christmas outfit. If you live in California, you know that bucks simply don’t come out in the open. Even when it’s not hunting season, they usually head the other direction as soon as they get a whiff of human beings. This was so unusual, we both understood it was a gift, a blessing. Owen takes her by the shoulders and beseeches her, implores her to understand what he’s discovered, “No, THESE are the golden days, THESE are the golden times.” She doesn’t listen to him. She’s convinced the grass is greener somewhere, sometime, else. So, here’s to the golden times, the golden days, the golden moments, the golden hours. May we steep ourselves in these blessings, imprint and appreciate them – right here, right now.